People often fall in love with a painting at a show but then wonder? How will it look at home? I took some tips from professional stylist Martina Mattsson in Gothenberg Sweden and created several looks in different rooms to give you ideas about how you can display your art. Photos by Jonas Berg. Using one painting as an 'anchor' and placing them asymmetrically creates a dynamic energizing background to a dining area. The bright colors of MIKATA 'Supporter or Ally' also support good digestion and conversation. Local architecture with local scenes in artwork create a sense of place. This oil is a plein air piece depicting Tjörn, a well known place of beauty nearby. Regional art can add to the character of a home-reflecting the surroundings outside as well as inside. An artist can interpret a location you identify with and want to bring home. 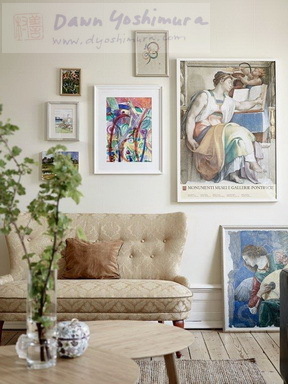 A neutral calm mid tone wall brings contrast to art. The walls don't have to be white to hang art. Choose themes that bring calmness for a bedroom. Note the paintings are in three asymmetrical groupings. 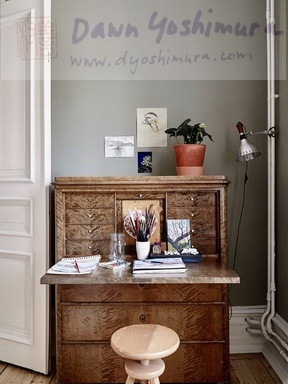 Artist Writing DeskAt your writing desk, earthquake putty is a nice way to have flexibility to hang up small drawings and photos. 1. Create groupings on a wall. Let your personality shine to create a unique home. 2. Make large and small groupings according to a theme or a particular color. 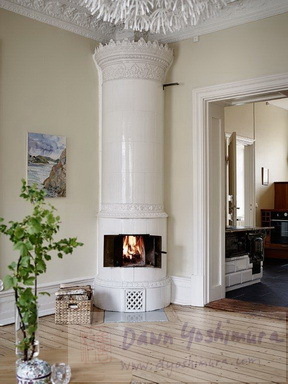 It can help create passages or cozy corners. 3. Use one piece as an ‘anchor’ but the group doesn’t have to be symmetrical. 4. Hang the paintings lower than you might normally think. In a gallery they are often higher so you are viewing at standing level. In sitting areas, it is more comfortable to have them at sitting height. This also gives the illusion of higher ceilings and space. 5. Mix and match your masterpieces with vacation art, posters with originals. It’s yours and you like it, so why not show them off? ​All artwork on this website by Dawn Yoshimura is protected by copyright. Reproduction without permission is strictly prohibited. Civil and criminal action can be taken in case of unauthorized use of images displayed on this site.​​ Copyright 2010-present. Dawn Yoshimura. All rights reserved.